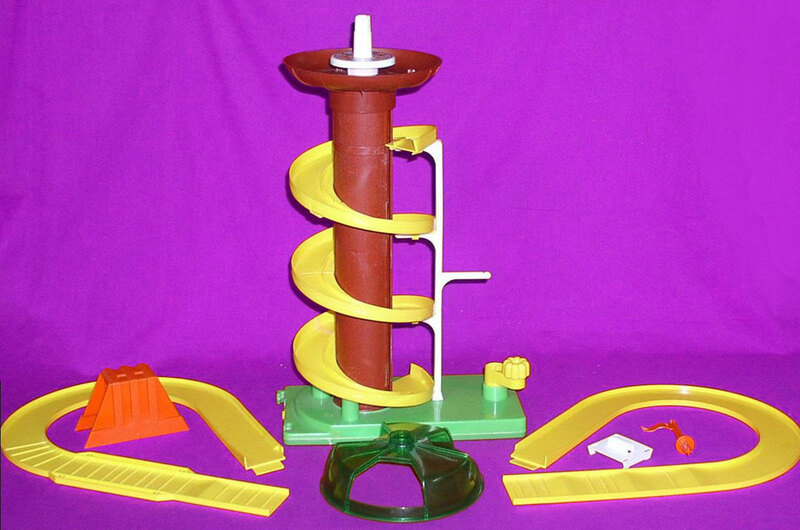 Description: No batteries required for this fun roller coaster! Simply turn the handle for bell to ring and to lift Tree Tots in their cars up the spiral track. Cars are automatically released at the top, then speed through the tunnel, and over the bumps to the finish line. Take a break from the coaster to enjoy a gourmet lunch in the revolving skytop restraunt located above the coaster. 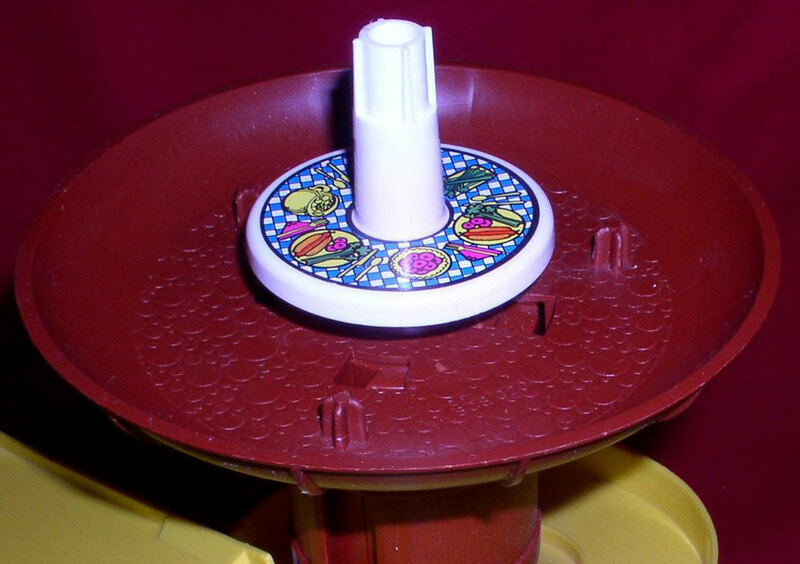 The coaster base has a 4-1/2" edge with puzzle placement pieces attached the coaster to any of the 1976 Tree Tots Amusement Park rides for a deluxe Amusement Park experience. 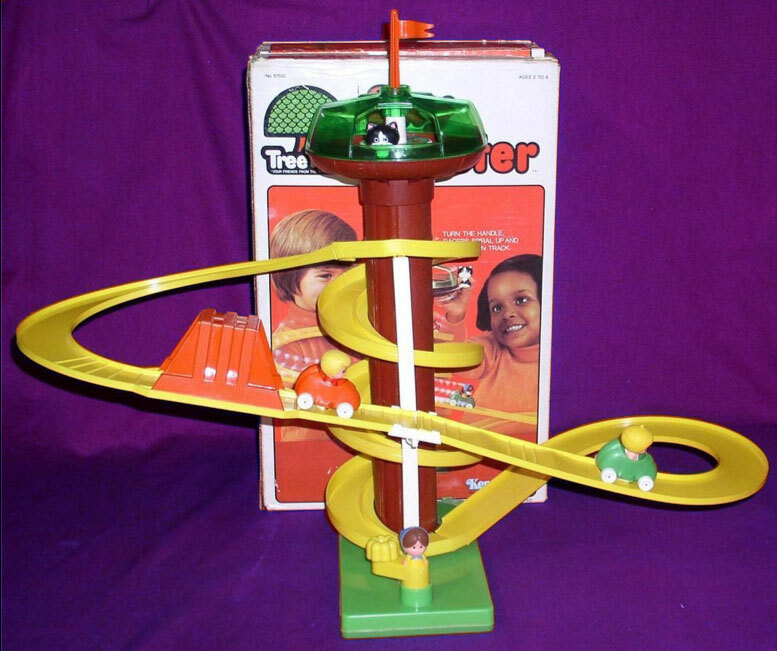 KTT55 - Sky Coaster Base - Green rectangular base with a yellow hand-crank and a tall brown tube with a yellow spiral ramp on the edges. 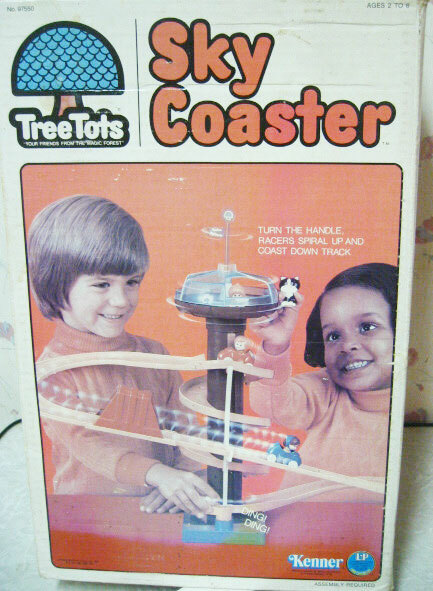 The top of the brown tube has a round skytop restaurant with a white table in the center (round restaurant litho on table top) and 3 upright peg "seats" for Tree Tot figures. KTT56 - Ramp #1 - Yellow U-shaped Ramp with raised bumps on the left side of the ramp. KTT57 - Ramp #2 - Yellow U-shaped Ramp with raised bumps on the right side of the ramp. KTT58 - Ramp Support - Square white ramp support that connect and support Ramp #1 and #2, and attaches them to the white support pole on the sky coaster base. KTT59 - Flag - Red flag with round base (plus shaped peg under round base to attach to top of sky coaster). KTT60 - Tunnel - Red squared tunnel that fits over the sky coaster ramps. KTT61 - Dome - Green-tinted Sky Coaster skytop restraunt dome that fits over the Skytop Restaurant on the sky coaster base. KTT64 - Man - Woodrow Tree Tot - Man with yellow hair and moustache, red shirt, blue pants and brown shoes. KTT65 - Woman - Fern Tree Tot - Woman with brown hair wearing a blue scarf on her head, yellow shirt, blue pants, and red shoes. KTT66 - Girl - Campy Tree Tot - Girl with yellow hair (tiny ponytail on top), no shoes, and wearing white overall shorts with a red bird on the chest. KTT67 - Cat - Pussywillow Tree Tot - Black and white cat with pink triangular inner ears, pink nose, and pink mouth.